Mirrors have long been a favorite design element for interior designers. In addition to adding a decorative touch, mirrors help any room feel larger and brighter and add depth to the space. The great thing about decorating with mirrors is there are no rules. Pretty much anything goes and there is no right or wrong way to use mirrors. Because they are like tiny windows or art work, you can put them anywhere you like. Mirrors are, simply stated, objects that reflect an image and are used mostly for grooming. The earliest mirrors were made of polished stone and volcanic rock and date back to 6000 B.C. in what is now Turkey. Polished copper mirrors date back to ancient Mesopotamia around 4000 B.C. Glassmakers on the island of Murano perfected the method of making mirrors out of plate glass in the 16th-century. In this method the back of the glass was coated with mercury. This Venetian mirror with it ornate decorative frames hung on the walls of palaces and fine homes throughout Europe for the next 100 years. Once the secret of using mercury was finally discovered, large-scale industrialization of the process in French workshops made mirrors affordable to the masses despite concerns over the toxicity of mercury. Today, the mirror substrate is shaped, polished and cleaned, and is then coated with silver or aluminum. 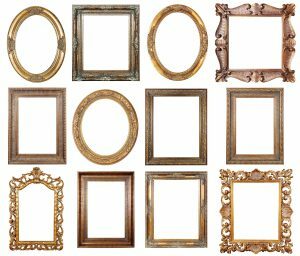 From simple and plain to ornate, mirrors come in many styles and sizes and are generally framed in wood or metal, although frameless mirrors are also used in contemporary homes. Because of their shape, vertical rectangular mirrors are used like art, photographs, or paintings. 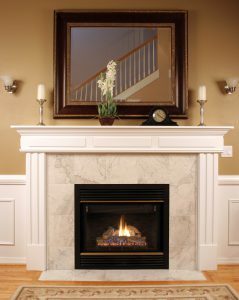 Horizontal rectangular mirrors are often found over mantels, sofas, or bars, and as a feature in an entryway, where visitors can quickly check their appearance after arriving. 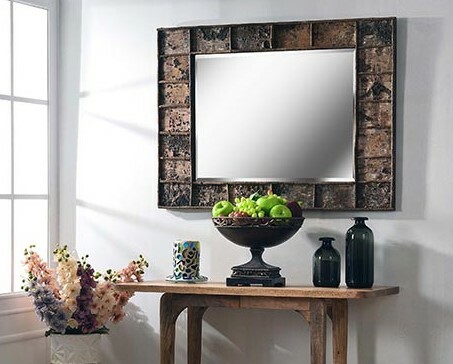 Rectangular mirrors can be leaned against a wall for a pretty and functional design element. Similarly, large oval mirrors are used as a focal point in a room, while small round and oval mirrors are often used in clusters like a photo montage. Sets of mirrors can bring much more interest to a wall and tell a story and can be laid out parallel, stair-stepped, or in a delta. The bathroom can use several styles of mirror from oval to rectangular to focus on the face and upper torso, while full length mirrors help check full body appearance. 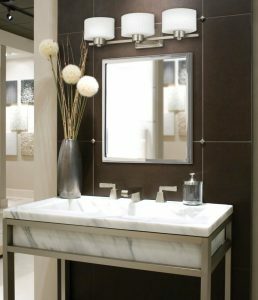 A mirror over a vanity is a must have and the choice of shape and style is up to the individual’s preference and the style of the decor. Ornate mirrors give a more formal look and are popular in Victorian style homes. Mirrors in a dining room add visual dimension and elegance, and enhance the lighting in the room. Proponents of Chinese feng shui (wind and water), a philosophy of harmonizing the environment, frown on the use of mirrors in the bedroom claiming it represents water or sorrow. If you do use mirrors, place them where you won’t see your reflection when you first wake up! Feng shui believes a mirror over a mantle brings energy to the room. Van Dyke’s has recently added the Quoizel mirror collection and has additional mirror collections coming in the next few weeks. 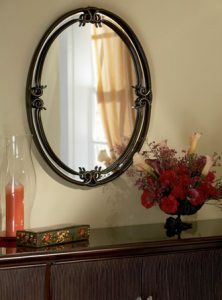 Check out the great selection and incorporate mirrors into your home decor.